Maria Skłodowska was born the youngest child of teachers in Warsaw, Poland. Family fortunes were not great, and Maria lost her mother at age twelve. Maria had to work as a tutor and governess to help finance her sister's education. Later, she was able to study in Paris at the Sorbonne with her sister's support. She also took courses in secret from the Floating University, an underground educational institution in politically turbulent Poland that educated women, and later also men. Determined to work and make progress in her chosen field of science, Maria studied and practiced physics and chemistry – subjects her father had taught. In 1894, Marie earned her second degree – this one in mathematics and met Pierre Curie, an instructor of physics and chemistry. Briefly separated when Marie returned to Poland, the two were married about a year later. Henri Becquerel soon discovered radioactivity while studying uranium salts. Marie took up the study of uranium rays, using a Curie electrometer. She was able to show that pitchblende, torbernite, and thorium were all radioactive. Marie Curie published a research paper on her discovery, an unusual step for a woman in 1896. Pierre set aside his own research and joined Marie in her work. By the summer of 1898, the Curies co-authored a paper on a new element, polonium. The day after Christmas 1898, a second paper came out, announcing the discovery of another new element – radium. They continued working together until the tragic death of Pierre in a street accident in 1906. Soldiering on alone, Marie was able by 1910 to isolate pure radium from pitchblende. Marie Curie decided not to patent her discovery so that other scientists could investigate it freely. 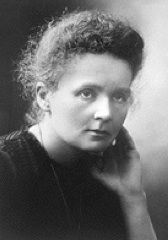 Marie Curie received two Nobel prizes for her scientific work. First, in 1903 for Physics, she was also the first woman to be awarded a Nobel Prize. Again in 1911, she was awarded the Nobel for Chemistry and became the first person to receive two Nobel Prizes. Despite these honors, the French Academy of Sciences barred her from membership. But at the Sorbonne, she became the first female professor and was given charge of the physics laboratory that her husband had chaired. Not long after, the government of France built the Radium Institute for the study of chemistry, physics, and medicine – Marie Curie's foremost interests. In World War I, she made possible mobile X-ray trucks which helped diagnose wounded troops. Selflessly, she gave away the two golden Nobel medals to raise funds for the war efforts. A pioneer of the study of radiation, Madam Curie did not know how radioactivity would affect her health. Never wearing protective clothing, she worked with radioactive materials with her own hands, keeping radium in her desk drawer, or in a pocket of her dress. Over the 38 years that she researched radioactivity, the effects of ionizing radiation were wearing her down. She passed away in 1934 from severe anemia. The work that had given life to others had affected the very marrow of her blood. Without Marie Curie's discovery and her husband Pierre's idea of implanting a small seed of radioactive material into a tumor to shrink it, we would not have brachytherapy. This type of internal radiation is used for many types of cancer, including early stage breast cancer. Next time you have an X-ray or need a zap of radiation to treat cancer, think of Marie Curie. Her work and sacrifice may make your life much easier. What Do Neutrophils Tell Us About Cancer Treatment?